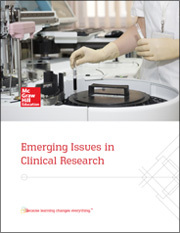 Clinical research has been pivotal in improving human health over the last century. Understanding of human biology and therapeutic innovation are direct results of sound clinical research involving human volunteers. Responsible and careful planning and implementation of research protocols, guided by ethical values and principles, safeguard the very people that the research is intended to benefit. This white paper addresses the practical applications of these principles.